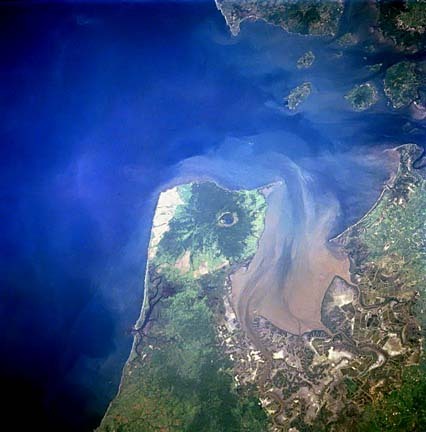 The Gulf of Fonseca (Golfo De Fonseca) is a shallow body of water that fronts the Central America countries of El Salvador, Honduras and Nicaragua. Discovered in 1522 by Gil Gonzalez de Avila, it stretches inward from the Pacific Ocean for just over 41 miles and covers an estimated area of 700 sq. miles. The fringes of this fertile volcanic landscape are indented by a seemingly endless series of winding lagoons - all covered by mangrove swamp. Important regional ports in the gulf include La Union (El Salvador), Amapala and San Lorenzo (Honduras), and Puerto Morazan (Nicaragua), not shown, as it's 22 miles inland along the Estero Real River. Significant islands include Conchaquita and Meanguera (El Salvador) and El Tigre and Zacate Grande (Honduras). This page was last updated on August 7, 2015.